Bavarian and Austrian family of sculptors. It is unique in having produced an unbroken sequence of 21 sculptors over 7 generations and more than 250 years from the 17th to the 19th century. At the head of the clan stands Hans Schwanthaler (d 1656), a sculptor in Ried im Innkreis, Bavaria (now Upper Austria). Ludwig von Schwanthaler is the last significant figure of the family. He was court sculptor to Ludwig I of Bavaria and was particularly noted for his massive monumental and architectural sculptures. He first trained with his father and then (1819-22) attended the Akademie der Bildenden Knste, established in Munich in 1808. As a pupil of Albrecht Adam, he first trained as a painter of battle pictures but then turned increasingly to sculpture. After his fathers death he took over his studio, receiving his first official commission in 1824 from Maximilian I Joseph of Bavaria (reg 1806-25), for a cycle of reliefs with scenes from ancient mythology for a table centre. 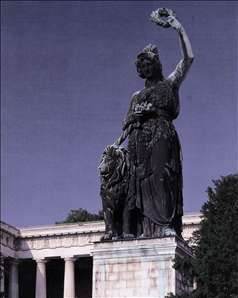 Schwanthaler was appointed a court sculptor, most of his activity being connected with the works of art and buildings commissioned by Ludwig I, King of Bavaria, from 1825. Periods spent by Schwanthaler in Rome in the years 1826-27 and 1832-34 were to have a crucial impact on his further development as a practising artist: in Bertel Thorvaldsen s studio he saw how an up-to-date large-scale artists studio of European renown was run as a business, and he adopted this as a model for his own studio in Munich. There he soon became a much sought-after sculptor, both at court and among the middle classes. At times he had as many as 50 pupils working in his studio. In 1835 he was appointed professor at the Akademie der Bildenden Knste. In 1837 he signed a contract for his master work, which would preoccupy him for the rest of his life, the colossal statue of Bavaria. See more details about "Bavaria"